While the Three Amigos continue to iron out the finer points of their upcoming restaurant franchise, they sometimes like to further their research by visiting existing eateries. Trio are in Andy's LoveBug and zipping past Wyevale, Grange Barn, and, er, Williams Stores of Grundisburgh. Stick that one on the list for later. Well out in the sticks and the (sadly not Werner Herzog) SatNav suggests following that no through road to Toad Hall. Werner knows best and leads us into Newton Hall Equitation. Here be horses. 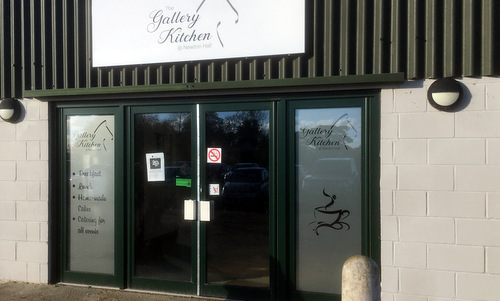 Website claims there's a place called the Gallery Kitchen too. Through the mud, yonder! Half a dozen cars and handy boot scrapers outside while breezeblocked innards resembles a less sophisticated version of First at Clopton. Minor difference would be that large window giving a widescreen view of the inside area where the horses trot around. Great with words, me. Plenty of tables and plenty of choice, all (by the looks of it) prepared by one very capable woman. She's offering three specials today: chilli, bacon & brie, or sausage & red marmalade. Two out of three for Kev and Andy and a cold-blooded fish finger sandwich for me since it's a Friday. Chips all round. Novel strawberry and mint drink on the side by Heartsease Farm. Food takes a while, clearly, but is well worth it. Big old thumbs up for the Stokes sauce and mayo on offer. Unusual posters are offering a quiz night and the chance to hire a pony. Aim low, they're riding Shetlands! Very different proposition from our previous equine visit to the Camargue Cafe but if you're in the area, it's Champion. If it was a car -- Sangyong Rexton EX. If they were passing by -- Leona Lewis.